Daily KLCI Poised To Stage A Breakout Above The Down Trend Line (DTL) Around 1515 Points. In line with the rebound in key Asian markets and Dow last Friday, the KLCI rose 5 points to 1508.9 as investors cheered a sigh of relief after Japanese engineers took a major positive step in managing the nuclear crisis. However, concerns of the surge in oil prices curbed appetite for riskier assets after Western powers launched air strikes on Libya, renewing fears over supplies of crude oil from Mideast. FBM KLCI outlook: A decisive breakout above Down-Trend-Line (DTL) will fuel more upside. 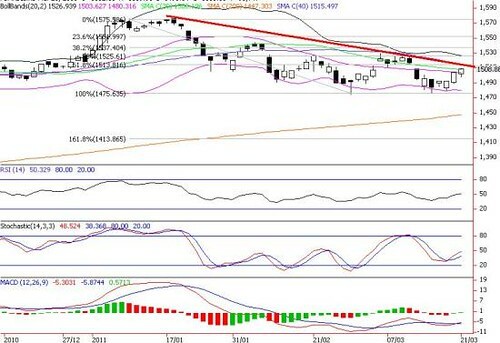 The KLCI is expected to retest In the DTL (1515) and 50% FR (1525) levels this week, in the wake of subsiding concerns on the nuclear crisis in Japan coupled with overnight gains on Wall Street. However, we could face more wild swings ahead, particularly from the resumption of crude oil rally should the UN-led attack is unable to bring an early end to Libya’s civil war. Key support levels are 1500 and 1480 (lower Bollinger band)while upside resistance levels are situated at 1515 and 1527 (upper Bollinger band).